This birthday card is pretty easy, and requires very little stamping. Most of the work is in the assembly. I used a white paper flower that I bought (and overpaid for) from a scrapbook store. If you want to use flowers in your cards or scrapbooking, but you can probably find something similar from some artificial flowers that you no longer use. If not, check the artificial flower section of your craft store first. You can pull off the flowers and save a couple of bucks on ‘scrapbooking supplies’. One other note about using flowers – if you buy them, just buy white ones. You can use chalks, pastels or inks to color a white flower to match your project. 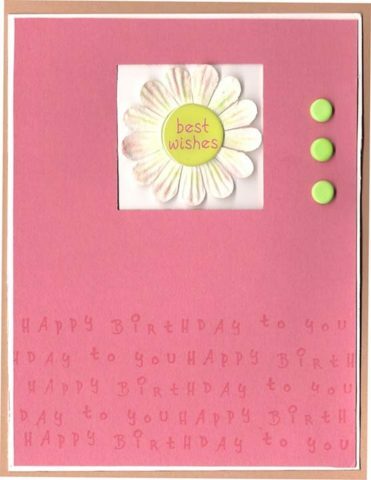 I used a large square punch to make the hole in the pink paper and attached the flower to the inside of the card. This way, when the recipient opens the card the flower sentiment is part of the message inside. I love Stampin’ Up products and use them whenever I can. You can certainly use any other products to make this card. Just use the idea and make it your own! If you’re interested in Stampin’ Up products, visit www.erinstevens.stampinup.net.